The more time you spend in learning something new, the better you get at it. Though this is synonymous to ‘practice makes one perfect,’ the undermining difference is the fact that no skill is same or gaining expertise of an assortment of subject matter is never alike. Hence, determining the speed with which one gains mastery over the subject in the form of a learning curve is a topic of concern, especially more so when you are a student. As it is quite natural for any student to favor a particular subject and dread over some other. Determining and understanding the numerous means of fast learning is vital for students which are gauged by their learning curve which is unique for every individual. There are different stages or steps to a learning curve wherein you could accelerate and master a skill or subject which is illustrated when your reach a steep learning phase which has both fast learning and slow learning steps. What is the Learning Curve? In a layman’s language, a learning curve is a process where a student develops a skill or understanding of a subject by learning from their mistakes. It is a graphical representation which the student can use to increase their learning speed which is measured as steps of fast learning represented by steep curves on the learning curve. Most often, ‘learning curve’ or ‘steps of fast learning curves’ is referred to two main scenarios with students: where a subject, skill, or knowledge is learned over time; where the same steps or protocol is repeated in trials over time to gain mastery over the procedure. It is sometimes associated with the term ‘steep learning curve’ that involves both fast learning and slow learning which is connected to the fact that some students learn a concept faster while some learn it better at a slow pace. Typically, learning involves the time factor and the effort put forth by the student to learn a particular concept or skill. It is also based on the perception the student possesses which influences their learning. Considering these facts, the following steps of learning curves are laid down for students which are influenced by their perception and learning. The foremost step is Slow Learning which contrary to its meaning, it is the primary step of a learning curve which is influenced by the uniqueness, newness, and difficulty level of a particular skill or subject matter. As the student acquires the basic knowledge pertaining to the skill or subject, they confidence over it which progresses to the next step of the curve which is known as ‘increasing returns’. 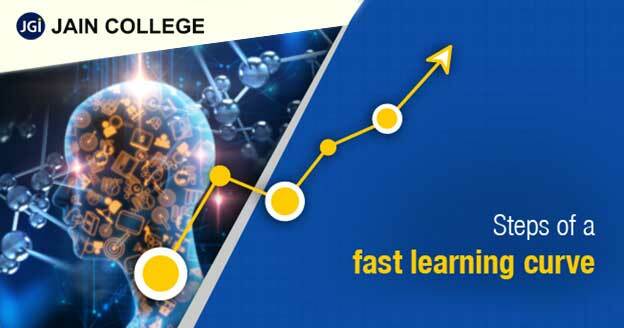 Fast Learning as the name suggests is the time that is considered when the learner is close to gain proficiency that follows the slow learning step. Increasing Returns is the second step of the learning curve where the student will gain confidence pertaining to what they have learned. It overlaps with the first and third step where slow learning is the former and Plateau is the latter. In this third step, the student garners the feeling of having acquired the necessary required skills where they find that there is no need of them refining or furthering that skill. It is a critical stage where the student must not stop the learning where the skill is concerned but develop or strategize new ideas to enhance the skill. The third step is the Peak Proficiency depicting the student’s proficiency where the skill or subject learned becomes a habit. This step is followed by the last step referred to as Over Learning where the proficiency is enhanced to such a level that the concept becomes unforgettable to the student. Apart from the first step, the rest of the stages can be achieved quickly with the help of fast learning tips. Although the learning curve of every individual is different where a particular skill is concerned, the speed of learning can be accelerated with a few simple fast learning tips. These pointers are easy to adopt and require very little effort. But firstly, it is very important to prepare oneself both mentally and physically before undertaking a new skill or concept. tudying the material more than once and with illustrations and apt examples will help you connect the learning to the real-world which will aid you in understanding the nitty-gritty of the concept. Taking notes and reading references supporting the concept will further your understanding. Gaining mastery by professing it is yet another means of accentuating the learning process. When you explain the concept to someone else, it enhances your confidence pertaining to the concept. It is one of the effective means of reaching genuine peak proficiency and quickly. Thus, the tips are simple and overlap with the basic study tips. However, they are also the key to augment one’s fast learning curve. What makes a college awesome?